A94 motorway from the east: Take the exit at München-Zamdorf, drive through the underpass under the motorway and follow Zamdorfer Straße. Turn left at Kastenbauerstraße and then right at the end of the road into Zamilastraße. After approximately 300 m you will reach the underground car park for visitors and the entrance to the loading area. Coming from the city centre: via the Mittlerer Ring-Ost and the A94 motorway in the direction of Passau, München-Steinhausen exit. 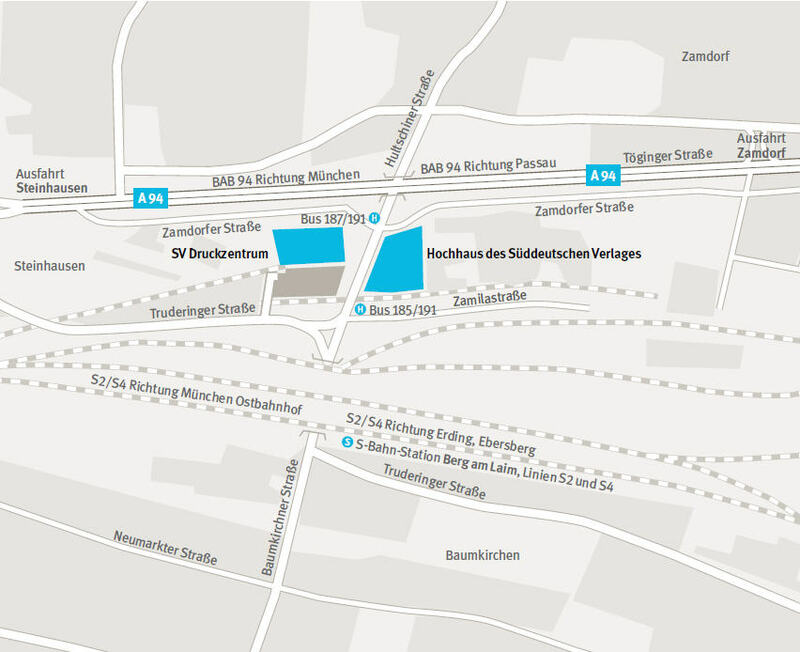 Follow Zamdorfer Straße past the SV-Druckzentrum (printing centre), turn right into Hultschiner Straße, past the building and at the next corner turn left into Zamilastraße; after approximately 200 m on the left you will reach the entrance to the underground garage. Bus routes 185 and 191 stop right outside the building, bus stop name "Hultschiner Straße"
Drive your car into the underground garage and press the bell at the barrier. Our reception will answer and ask you to use a free parking space in underground garage U1. From there you can take the lift or stairs to the ground floor. Please report personally to the reception in the atrium.